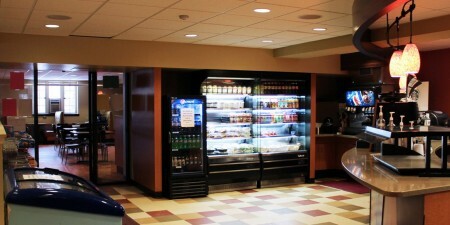 Lowe Dining Hall offers a great assortment of meal options served cafeteria-style. The family-like atmosphere and historic setting of Lowe Dining Hall creates a bustling, fun meal environment and gathering area for the student body. The staff in Lowe Dining Hall can help with dietary restrictions and boxed lunch options to accommodate the busy student lifestyle. Please see the Campus Dish site for additional information. Food Service Director, Darren Achtzehn talks about the newly renovated Lowe Dining Hall in the video below.